If you ask Carter to show you his “special foot” he’ll rush over and pull of his shoe and slide his right foot close to you. It doesn’t take long to see what makes his foot “special”. It’s skinny and bony and it only has 3 toes. We don’t know why it’s like that, but (so far) it doesn’t seem to be connected with any other anomalies or syndromes. When he was still in utero, we saw 10 perfect little fingers on the ultrasound. And 5 perfect little toes on a perfect little foot, but the other foot was folded up under his behind and we couldn’t see it. No big deal, we thought. After he was born and they were cleaning him up, a nurse noticed that he only had 3 toes. They called the pediatric nurse practitioner in and she brought him to my bedside all clean and swaddled. She started talking, “Well…blahblahblah…the nurses called me in to take a look at something and…blahblahblah…there seems to be a small abnormality and…blahblahblah…he only has three toes on this one little foot.” It seemed like she talked for 10 minutes and when she showed me his adorable little foot, do you know what I did? I laughed. I laughed! And then she looked at me like I was nuts. “Ha! That’s kinda funny!” I remember saying. But I said that because she had built it up to be so huge and scary that I honest-to-goodness thought that he had an extra head growing out of his neck. (I have an active and odd imagination). Off and on for the next few months, we spent time talking to orthopedic specialists. They looked around to see if they could find any reason for this to have happened, trying to make sure there were no other associated problems that hadn’t surfaced yet. They watched the leg growth and did x-rays and watched it grow some more. They told us when he was little that there wouldn’t be much to do about the foot. Apparently it’s not very easy to add toes to a foot. I don’t know why! But the problem that they did foresee was that the leg with the special foot was also shorter. For a long time the length difference was negligible. But recently we began to notice that the long leg had gotten a lot longer. His gait changed and he was standing sideways and the worry is that he could injure his hip and/or spine. So we go today to visit the orthopedist again. When he was little they told us that the plan was to wait until he was older and hit a big growth spurt and at that point they’d do surgery to staple the growth plate of the long leg and give the short leg a chance to catch up. I’m not sure if they’ve had any advances in medicine in the past 8 years that would change that plan or not. I guess we’ll find that out today. Either way, I’m oddly not nervous about it. I’ve talked to him about it and he seems so okay with whatever might happen. (I think if I were more nervous, he would be more nervous). Maybe it’s naive of me; I don’t know. But I do have a peace about it that I can’t quite explain, and I am grateful for that! I find myself humming “Que sera, sera” every time I think about it because it is true: what will be, will be. And we’ll figure out one step at a time and trust that in the end it’ll all be okay. (But I won’t turn down a prayer or two if you have one to spare). We have plenty of prayers to spread around! When we found out about Bella’s thyroid condition, I was the same way. Not nervous about it at all. I think her doctor wanted more of a reaction out of me, but all I could figure was whatever it brings we will take it in stride. 3&1/2 years later we are still giving her mess and getting blood drawn,(that does get more difficult as she gets older and knows what’s going on) but we are going with the flow and she is growing wonderfully. I love that you laughed! It was probably such a relief after the big speech. Definitely praying for you guys today. Right now I have a massive appreciation for you and your outlook. I love that you laughed and I love that he calls it special. Praying for you all today! Praying for y’all this morning. That sense of calmness is God’s way of telling you that he has this under control! Sending prayers. I remember being in the room when he was born and you laughed and I remember you saying ‘is that all?’ (or at least that’s how I remember it) I noticed the difference the length the last time we saw him. I know he will do well with whatever the doctors and you&marshall decide to do. He is special (and not just his foot!) and his outlook is so wonderful. 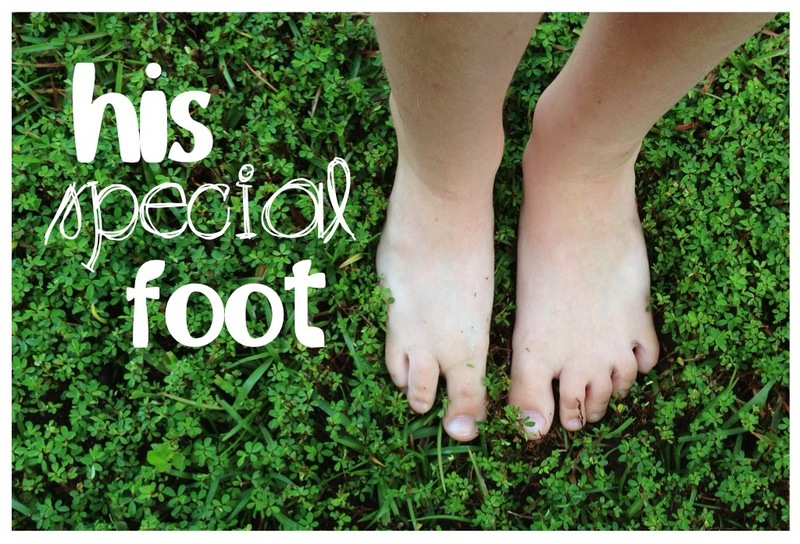 Special feet are the coolest feet! I will never forget our med school show and tell; you and Marshall showed us his special foot and let us transilluminate his hydrocele!! He was such a laid back baby. Love you! Praying for you and your big boy!! I hope people google transilluminate and hydrocele if they don’t know what that means! Haha! Definitely praying! Glad you are at peace…I’m sure that’s a good thing! I remember you also calling the Jo’s toes because they reminded you of Mama Jo’s foot with her rheumatoid arthritis. I also see that you have learned a lesson from me and Granddaddy and that is you don’t have to worry about things that you can not control. You put those things in the Lord’s hands and he will take care of those. Be careful on the way home. Love y’all. I am praying for ya’ll as well. I also remember that Jo’s toes was what you called them. Mama Jo was in that delivery room with you at that special time in your life. Love ya’ll!!! Saw this late this evening. Hoping you were given wonderful news and hope. He’s lucky to have such a wonderful momma! The faith that you show is so refreshing. I will pray for you even though it’s too late for his appointment, but who can’t use a prayer?! Sending love and good wishes your way! Ah, this post brings so many Bible verses to mind.